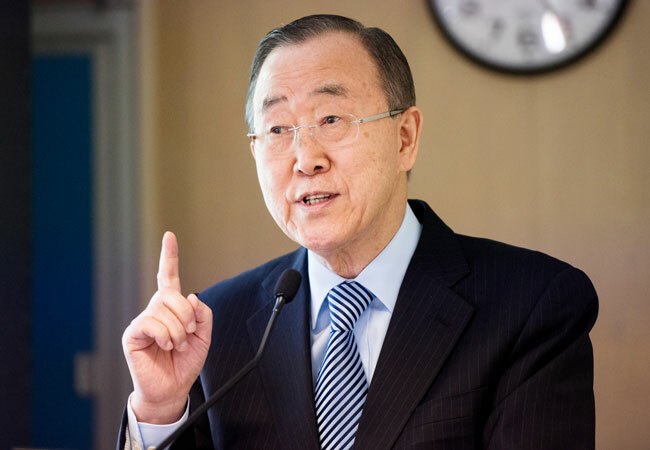 Delivering the keynote speech on California's journey to achieving Universal Health Coverage, Ban Ki-moon praises the state’s progressive leadership and urges further ambition to an audience of academics, medical professionals, policy-makers and activists. This event was co-hosted by The Elders, UCSF, the Zuckerberg San Francisco General Hospital and Project Muso on 11 September 2018. Find out more and watch the livestream. I am honoured to be with you this afternoon in this magnificent hospital on the eve of the Climate Action Summit. This gives me the perfect opportunity to talk about two issues dear to my heart – universal health coverage and tackling climate change. I am here as a member of The Elders, the organisation launched by Nelson Mandela of independent global leaders working together for peace, justice and human rights. The Elders, including Mary Robinson and Ricardo Lagos here today, are committed to helping the world achieve the Sustainable Development Goals. Today of course is a sombre occasion across the United States as we remember all those killed in the terrorist atrocities in New York and Washington DC on September 11 2001. The attacks on the World Trade Center and the Pentagon were an attack on the whole world, on the shared values that bind us together in our common humanity. 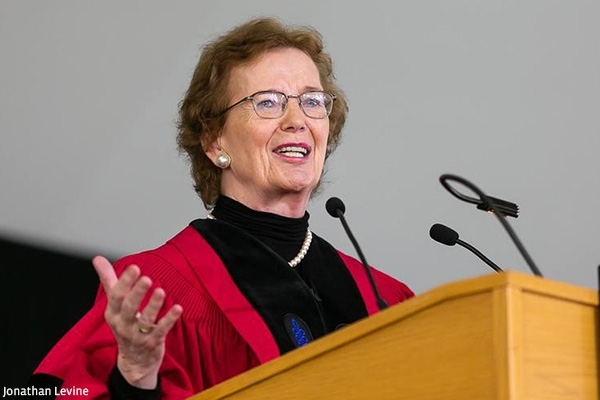 The Elders believe that the best way to counter and defeat violent extremism is to build a world that delivers peace, justice, health, security and human rights for all global citizens. This is the vision that underpins the SDGs, and is integral to what we are talking about here today. It is also a sombre time for The Elders as we mourn our friend and former Chair, Kofi Annan. 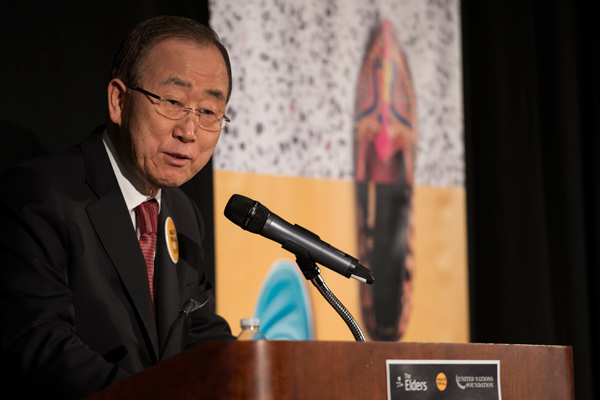 Kofi was a monumental leader, and a committed humanitarian who cared passionately about health and climate change. I tried to follow in his footsteps when I succeeded him as Secretary-General of the United Nations, and my fellow Elders and I are determined to honour his legacy by continuing to fight for the causes of peace, human rights and development that he held so dear, and which he knew are so closely intertwined. In my previous role as UN Secretary General, three years ago, I had the privilege to witness every country in the world commit themselves to achieving the SDGs. They represent a universal call to action to end poverty, protect the planet and ensure that all people enjoy peace and prosperity. These goals are built on principles of rights and equity and the shared belief that no-one should be left behind. Moreover, they are universal and apply to the United States just as they do to my own country and every nation on the planet. Two of these goals relate specifically to ensuring healthy lives for everyone (SDG 3) and taking urgent action to combat climate change (SDG 13). These two agendas are inextricably linked, with climate inaction representing a major threat to global health – if not our very existence. One only has to reflect for a moment on the terrible impact of the recent wild fires in California to see the impact that climate change is having on people’s health and wellbeing. Kofi Annan called climate change the greatest existential threat of our age. He knew that it could not be tackled by governments alone; people at every level in society need to make their voices heard and pressure their leaders into action. I am sure he would have been heartened to see the thousands of people marching in California and elsewhere across the United States last weekend, ahead of the Global Climate Action Summit that Governor Brown is hosting here. It reminds me of the huge crowds in New York for the People’s Climate March in 2014, which helped galvanise momentum and ambition in the final push for the Paris Climate Agreement the following year. Now, as then, people were marching for the health of our planet – and by extension, their own. As the climate changes, it affects the wellbeing of each and every one of us – be it the impact of extreme weather, the spread of infectious diseases as the world heats up, or the consequences of fossil fuel pollution. When we speak about our health, we must remember it is intertwined with the fate of the health of our planet - not just for us here today but also for the generations that will follow. Of course many factors affect people’s health, including their income levels, education, nutrition, peace and other environmental factors. But as everyone in this hospital appreciates, access to good quality health services also plays a crucial role in protecting and restoring people’s health. That’s why the World Bank, the World Health Organisation and we at The Elders believe that the best way to reach the health SDG is through Universal Health Coverage. This is achieved when everybody receives the quality health services they need, without suffering financial hardship. Universal health coverage is built on principles of equity and fairness, with health services allocated according to people’s needs and the health system financed according to people’s ability to pay. It means that healthy wealthy people subsidise health services for the sick and the poor, recognising both their own interest and the common benefits in a healthy society. When people simply buy and sell health services as a commodity rather than a public good, these subsidies do not occur and only rich people get access to expensive, life-saving treatments. This is unjust, unfair and ultimately threatens everybody’s health when poorer people with communicable diseases can’t afford treatments for their infections. Global evidence shows that the only way to reach truly universal health coverage is through switching to a health financing system that is dominated by public financing - either through general taxation or progressive social health insurance. This has been recognised across Europe, Latin America, Australasia, much of Asia and also in America’s nearest neighbours - Canada and Mexico. Frankly, those of us in the rest of the world find it astonishing that the United States is the only high income country not to switch to a publicly-financed health system. As a result, 28 million Americans still lack health insurance and many millions more face unaffordable co-payments when accessing care. This is all the more astonishing when one considers that America spends 17% of its GDP on its health system, 40% higher than the average of other rich countries. In a country teeming with medical talent, expertise and world-class clinical services, it is surely unacceptable that population health outcomes are worse than in many middle income countries, because access to services is so woefully inequitable. As you are all fully aware, implementing health financing reforms is highly political. So whereas it was a flagship policy of your previous President to take America towards UHC, it would appear to be a top priority of the current administration to undo these reforms. As a result, the United States as a whole is undoubtedly moving away from UHC and its performance against this vital SDG target is deteriorating. It grieves me to see the same thing happening as well with climate change, with the US retreating from SDG 13 following President Trump’s decision to withdraw from the Paris Agreement. However despite these setbacks, the good news is that at a state level things appear to be changing for the better. Increasingly, progressive leaders in some states are recognising that they have the power to tackle these agendas. And perhaps no state is showing this determination more than California. The California Climate Action Summit clearly shows the commitment of the government and people of this state to demonstrate much-needed leadership. And you also have the same commitment to extending health coverage to all people living in California, as demonstrated by the passing of the recent bill entitling undocumented migrants to publicly funded healthcare. Ban Ki-moon, Ricardo Lagos and Mary Robinson visit a HIV Clinic at the Zuckerberg San Francisco General Hospital in September 2018. I know that there is a lively debate raging about whether California should embrace more radical health reforms and switch to a predominantly publicly financed, single-payer system. We Elders are not here to interfere in state politics or to claim we have all the answers. But when we look around the world, and when we reflect on the political, economic and social history of our own countries, the evidence is clear to us that such a publicly financed single-payer system is the only way of reaching UHC. The phenomenon of states pioneering UHC reforms which then catalyse nationwide reforms has happened before, for example in Canada, and is also happening today in other large countries without UHC, as I saw for myself just last week in Delhi in India – where innovative reforms at a state level offer hope to some of the 600 million Indians who lack access to affordable healthcare. In all these cases the road to UHC is long and arduous. But it is vital that we stay the course in all corners of the globe, and put pressure on our leaders when they appear to falter or mull a change in direction. Above all, we must assert the economic feasibility as well as the political desirability of UHC. Indeed, there is an opportunity in the challenges presented to us by climate change. As Californians know, investment in fossil fuels is one of the most pernicious barriers to creating a low carbon future. Directing these huge sums of money into funding UHC – so we can address the health consequences of fossil fuel use, rather than exacerbate them – is the scale of initiative needed if we are to realise these two intertwined objectives. The great Indian economist Amartya Sen calls UHC an “affordable dream”. 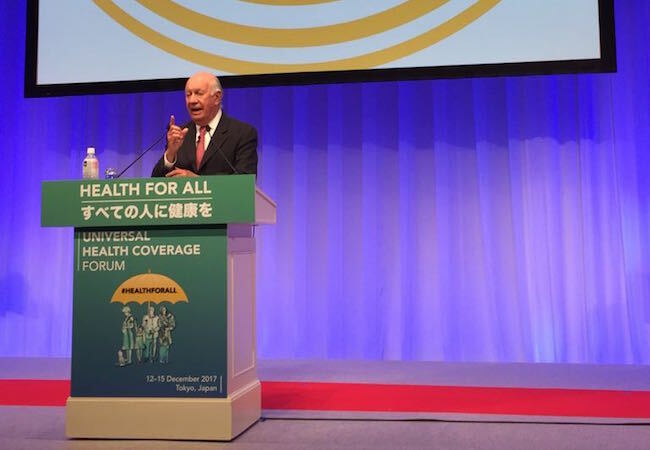 Here in the United States of America, a country with the dream of progress at the heart of its national identity, I am confident that the benefits of UHC will be ever-more appreciated in the coming years, that political momentum will continue to grow, and affordable health can be a reality, with no-one left behind.